Inventory We are a resale marketplace, not a box office or venue. Ticket prices may exceed face value. This site is not owned by Aloha Stadium . Aloha Stadium opened in 1975 and is located in Halawa, Hawaii, a western suburb of Honolulu and is the largest stadium in all of Hawaii. It is the home to the Hawaii Rainbow Warriors football team of the Mountain West Conference in NCAA Division 1 FBS and was the home of the baseball team AAA Hawaii Islanders of the Pacific Coast League. The arena has a seating capacity of 50,000 and has hosted sporting events of Soccer, Football, Baseball, and Rugby. Additionally, famous artists such as Michael Jackson, Whitney Houston, U2, and The Eagles have performed here. 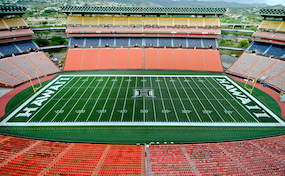 StadiumHonolulu.com is an independently owned and operated company thae operates entirely in the secondary resale market. We are not at this time affiliated with any primary box office, venue, and or official supplier. Prices on our sites tend to be above face value and will change quickly with demand. To order tickets to all Aloha Stadium Honolulu events please follow the process online through the checkout or pick up the phone and call our friendly operators at anytime.